Catherine yearned to become a nun, but her father was opposed for the longest time. Finally, she made her way to Paris because her father thought that life in the big city would change her mind. 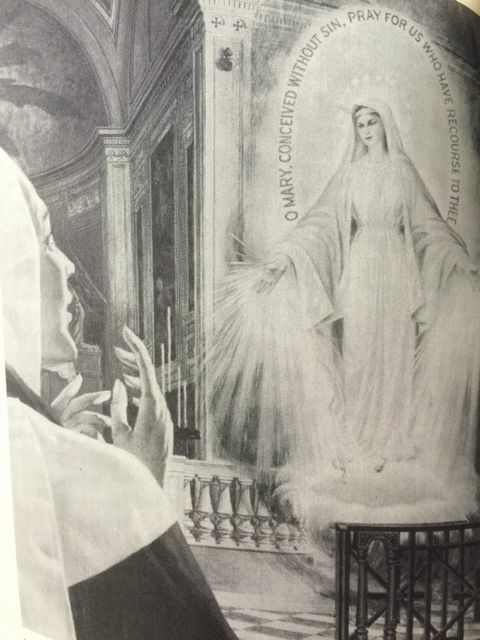 As she was visiting her aunt in nearby Chatillon, she stopped in at the convent of the Sisters of Charity. As she was ushered into the parlor, she froze in her tracks. There on the wall was a painting of an old priest – the very same old priest from her unforgettable dream! She was told that it was Saint Vincent de Paul. 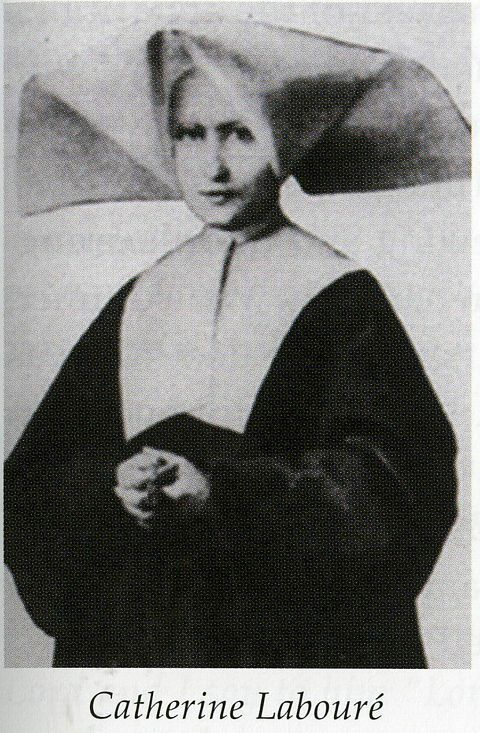 Catherine Laboure at Rue du Bac convent in Paris, France. 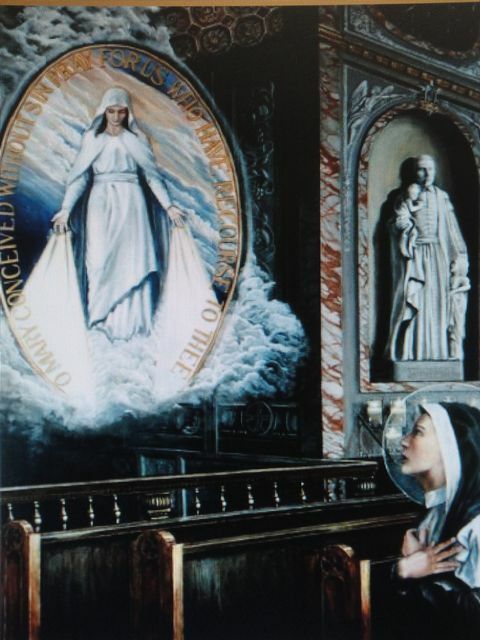 On April 21, 1830, she entered the convent of the Sisters of Charity at 140 Rue du Bac in Paris. On the eve of the Feast of St. Vincent de Paul, Catherine worked hard to prepare the chapel and convent for the next day’s events. Exhausted, she fell into a deep sleep on this night of July 18, 1830. Catherine is led by a “glowing child-angel” to meet the Virgin Mary in 1830. Catherine’s heart pounded furiously. From out of nowhere, the most beautiful lady she had ever seen, appeared before her. Mary appeared so young and exuberant. The Blessed Virgin sat in the priest’s chair. A wave of emotion swept through Catherine. She paused, then rushed forward, kneeling and placing her hands on Mary’s knees. Catherine is stunned by the appearance and words of the Blessed Virgin. Mary sat with her for what seemed like an eternity. She instructed Catherine in the proper behavior of a nun. She also gave her private secrets, many of which were revealed towards the end of Catherine’s life. Other secrets were never revealed. “My child, rely on prayer when your heart is troubled. God wishes to entrust a mission to you. It will be the cause of great suffering to you, but you will surmount it with the thought that it will work to God’s glory. You will be contradicted, but do not fear. Grace will be given to help you. In your prayers inspiration will be given to you. The times are very evil. Great misfortune will come to France. Her throne will be over thrown. There will also be victims among the clergy. The archbishop himself will die. The glowing angel stands by while Mary instructs Catherine for two hours. Mary finally broke down in tears after revealing all the misfortunes and outrages that France would suffer. Catherine pondered all that had been said, wondering what her mission was to be. The angel boy faded away as she got back into bed. She was so excited that she could not fall back asleep. 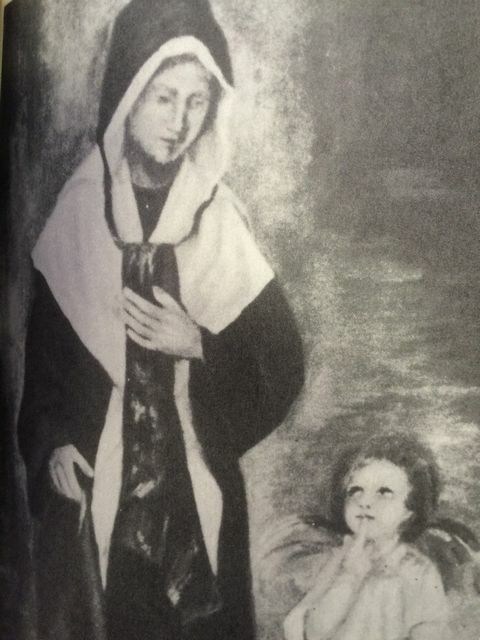 The first image that the Virgin Mary wanted Catherine to remember. 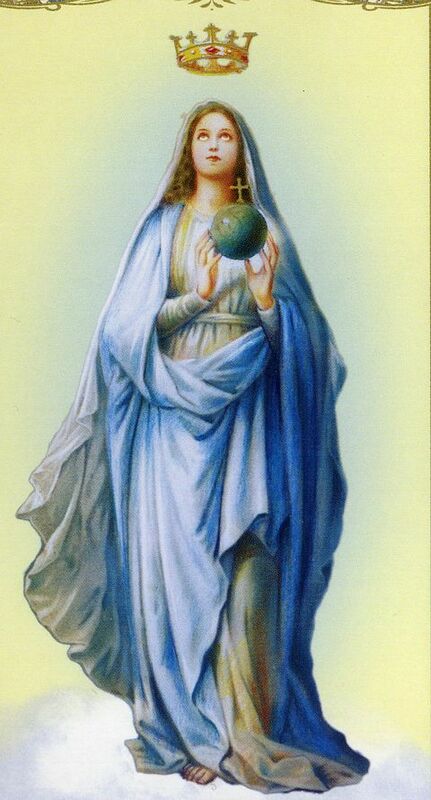 Within one week, Mary’s predictions began to happen as riots broke out on the streets. Paris became a “bloodbath for three days” and then the king was deposed and fled the country. The revolutionary forces slaughtered priests and religious. But, as Mary had promised, no harm came to the sisters of the Rue du Bac convent. 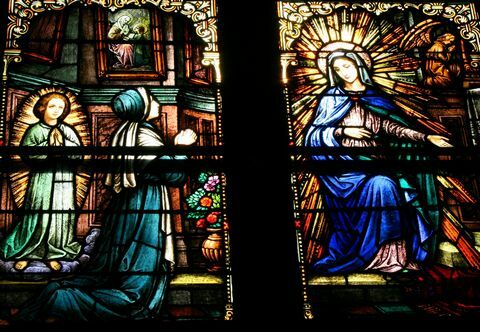 Rays of light stream from Mary’s hands as graces are dispensed. 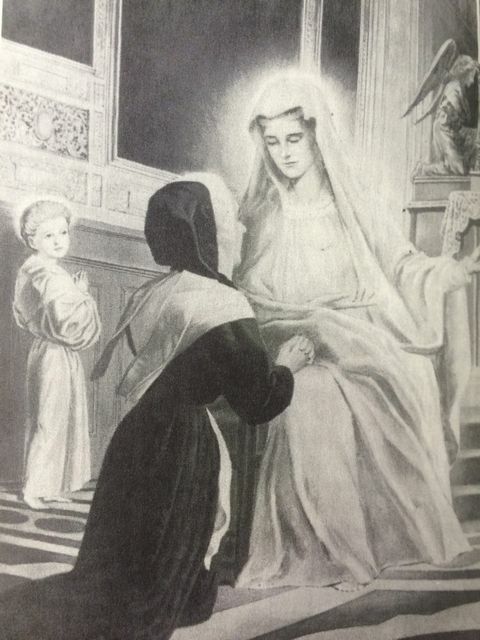 Mary emphasized how many graces lie unclaimed because nobody asks for them. Then the golden ball vanished from Her hands, and her arms dropped downward — hands held outward as if to welcome. The rays of light focused downward on the globe beneath Her. An oval frame appeared around her with these words: “O Mary, conceived without sin, pray for us who have recourse to thee.” Mary said to have a medal made in this image with these words, and all who wear it around their neck with confidence will be blessed with abundant graces and enjoy the special protection of the Mother. The Virgin Mary gives Catherine the images for the medal she wants struck. The image turned and Our Lady disappeared. The back side of the medal was to contain these images: a large M with a bar through it and a cross extending from it, two hearts below the M – one surrounded by thorns (Sacred Heart of Jesus), one pierced by a knife with droplets of blood dripping from it (Immaculate Heart of Mary), and twelve stars surrounding these images on an oval border. Then, it all faded away slowly. Catherine felt a great urgency to have this medal created. But her confessor, Father Aladel, did not share the same urgency and had many other important matters to attend. 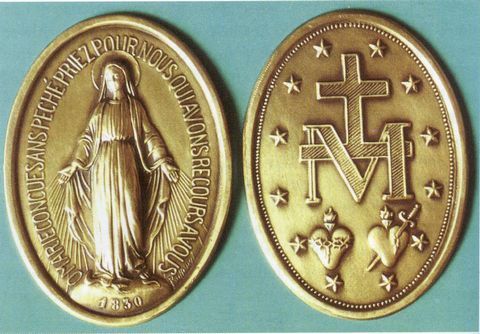 The actual Miraculous Medal as designed precisely by the Virgin Mary. Mary knew that this would greatly disturb the priest – who actually trembled at the thought of displeasing the Mother of God. He used as his justification for the medal that the reported predictions by Mary HAD COME TRUE. The medal struck in 1832 was originally called the “Medal of the Immaculate Conception.” But what was to follow led to the popular change in its name to the “Miraculous Medal.” Reports started pouring in from those who wore the new medal: physical cures, conversions, and miracles of every sort. Even the Archbishop of Paris, who had finally authorized the medal’s production, was one of the first to wear it and experience a miracle. 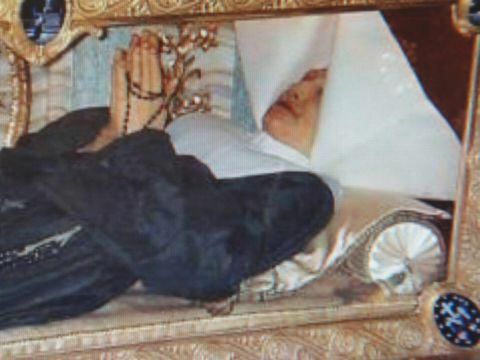 The incorrupt (non-decaying) body of Catherine Laboure in Paris, France. Two million were distributed worldwide by 1836. Reports came in of miraculous healings of those who had been hopelessly incurable. Some of the worst enemies of the Church experienced unlikely and amazing conversions. By the 21st century more than a billion medals had been reproduced and spread worldwide. Catherine downplayed her own importance, wanting others to focus on Mary, not her. She went to work for the next 45 years at a hospital for old people on the outskirts of Paris, taking care of the sick – as St. Vincent de Paul had predicted in Catherine’s dream at age 19. Catherine Laboure quietly died on December 31, 1876. On May 28, 1933, she was beatified in St. Peter’s Basilica in Rome. As part of the Canonization process, the body of the saint had to be identified. In a solemn procession, her coffin was removed from the vault under the convent’s chapel and brought to the Mother house at Rue du Bac. In the presence of the Archbishop of Paris, civil officials, and various doctors, the coffin was opened. They were stunned at what they witnessed. The body of Catherine Laboure had been in this coffin for 57 years – and yet, she had not decayed in the slightest. It was as if she were still alive and simply sleeping peacefully. She was canonized in 1947. Today, some 139 years later, she is still perfectly preserved by supernatural means as a “totally incorrupt” body – and can be viewed, enclosed by glass, in the little chapel at 140 Rue du Bac in Paris, France.